The PlayStation (abbreviated PS, PSone, PS1, or informally as PSX) is a 32-bit fifth generation video game console released by Sony Computer Entertainment in December 1994. The PlayStation was the first of the ubiquitous PlayStation series of console and handheld game devices. Successor consoles and upgrades include the Net Yaroze, PS one, PocketStation, PlayStation 2, a revised slimline PlayStation 2, PlayStation Portable, a revised PlayStation Portable Slim and Lite, PSX, and the PlayStation 3. On March 31 2005, the PlayStation and PS one reached a combined total of 102.49 million units shipped, becoming the first video game console to reach the 100 million mark. As of July 20, 2008, the PlayStation has sold 102 million units. Sony ceased production of the PlayStation on March 23, 2006, over 11 years since it was first produced. 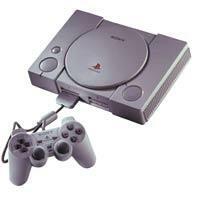 The 32-bit processor delivers all the power, visual clarity, and extraordinary gameplay of the original PlayStation.